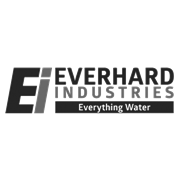 Everhard EasyDRAIN Channel and Polymer Grate is an easy DIY surface water drainage system suitable for around the home and light commercial areas including exterior patios, swimming pool areas, driveways, playgrounds, paved terraces, car parks and walkways. Wheel load capacity is 1.5 tonne per 1m channel and polymer grate when installed as per manufacturer's instructions. • Dig a trench 185mm deep and 250mm wide. • Place compacted bedding sand or concrete in the base of the trench. • Use a string line to ensure straightness and the correct finish height. 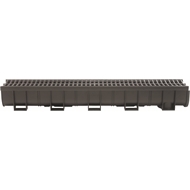 • Attach the grates to the channel prior to installation. • Connect End Cap to ends of EasyDRAIN channel and seal with silicone. • If required, cut the EasyDRAIN channel to the desired length. • Cut an outlet in the base of the channel or End Cap as required to connect to PVC pipe. • Connect lengths of channel as necessary ensuring that the joints click together. • Place a suitable expansion material along the top edge of the channel. • Pour concrete around each side of the EasyDRAIN channel ensuring that the base of the channel is completely immersed. • Finish the concrete to approximately 3mm above the level of the grate.